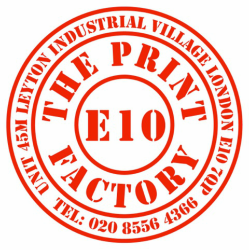 The Print Factory: How we work and what we use - Personalised printing for business, for events, for you. Print options... choice of materials... fonts... design.... if you are new to print production and a little bewildered, we can guide you painlessly through all the possibilities or, you maybe quite experienced in this field and deliver us your existing brief. Either way, once we have put together your design, we will send the results to you as a PDF 'proof' for checking, or you may prefer to see it in person here at The Print Factory. The proof is important as it lets you see the concept come to life and gives you an opportunity to make any amendments or alterations to the layout. When you are completely happy with your bespoke artwork we then ask you to 'sign it off'. Once we have received this final confirmation it gives us the nod to go to print. We take pride in our hands-on, skilled, know-how, to produce your individual print requirements. We have extremely high expectations and believe that printing is a craft which only a true, experienced professional can undertake. The technology works on the basic principle that ink and water do not mix. The image is put on a thin metal plate which is dampened by water and ink from rollers on the printing press. The oil-based ink adheres to the image area and the water to the non-image area. The inked area is then transferred to a rubber cylinder or "blanket" and then onto the paper as it passes around the blanket. The process is also known as "offset" since the image does not transfer directly from the plates to the paper but is offset or transferred to another surface as the intermediary. Thermographic printing provides a luxurious yet affordable embossed feel and with it's texture and durability, lends itself perfectly to items such as greeting cards, invitations, business cards and headed stationery. Thermography is a process where the image or type is raised. The process starts with the ink, still wet, being coated with a fine powdered resin. The excess powder is then removed and, as the printed matter passes along a conveyor belt on the thermo-machine, extreme heat fuses the print onto the card/paper and the combination of powder and ink dries to create a glorious textured, raised, high gloss finish. We also offer digital printing which differs from offset printing as there is no need for film, plates and pre-press assembly work. The 'ideal' solution for small runs with a quick turnaround. We use reputable UK paper merchants using sustainable resources for all our paper supplies. We are of course more than happy and willing to source and use alternative stationery stock outside of our in-house range.